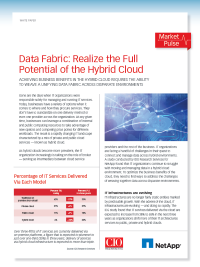 Download this white paper and learn how IT infrastructures are evolving and how a data fabric that weaves together disparate data elements of the hybrid cloud into a single, integrated architecture can harness the power of cloud while maintaining control. Hybrid IT infrastructures—leveraging public cloud and internal IT resources—are increasingly becoming the norm, as IT organizations take on the role of service broker. But this also brings about a handful of challenges. A recent study conducted by IDG Research Services found that IT organizations continue to struggle with moving and managing data in a hybrid cloud environment. The study found that while IT organizations are bullish about cloud, the majority of respondent’s data (just under 60%) still reside in non-cloud environments.